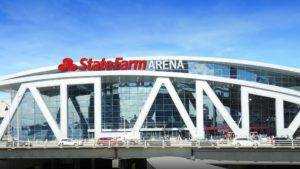 When the Atlanta Hawks tip off the 2018-19 season in a few weeks, they will do so at the State Farm Arena rather than Philips Arena. It is the same venue, but a new naming rights deal covering 20 years for $175 million will be in place. When the building opened 20 years ago it was Philips that had a similar term on naming rights, which is sext to expire next year. The venue has been quite busy lately after going through a $192.5 million renovation project that has taken place the last two years and on track for an October completion just in time for the NBA schedule.